To receive the catalogues for our Deauville or Saint-Cloud sales, please ask online), call +33(0)2.31.81.81.00 or send an email to info@arqana.com. All catalogues can be viewed online from a computer, a smartphone or a touch pad. All information here. For any other information, do not hesitate to consult the calendar. Furthermore, on sales day, you can call on the vets who attend all our sales to obtain a detailed examination of the lot(s) you are interested in. Check out the list of French trainers on www.entraîneurs-galop.com or the 2013 French Gallop Racing Panorama. Each horse is knocked down to the highest and final bidder, who completes the transaction by signing a Purchase Confirmation. 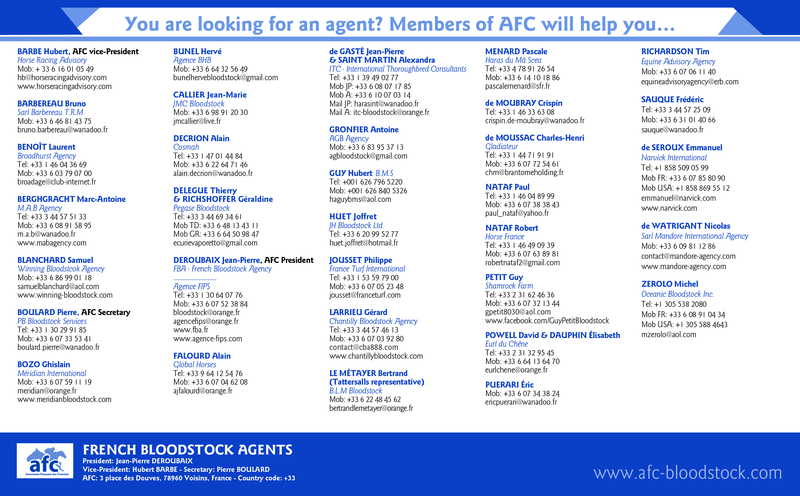 The purchaser can appoint a representative (bloodstock agent or trainer) to bid on his/her behalf. In this case, a Purchasers Authorisation must be filled in and transferred to ARQANA before the sale. Auction sales are reputed to be cash sales. The purchaser must pay the full amount of the price bid by cheque, bank transfer or transfer from a France Galop account, immediately after the purchase. For more information on the conditions of purchase, please read ARQANA’s General Conditions of Sale. The purchase price is before tax. There is a buyers commission of 6% before tax on top of the purchase price. 10% for broodmares which have been covered, fillies out of training due to be covered during the next covering season, stallions and stallion shares. 20% for all other horses including those of racing age, yearlings and foals. A 5% commission on the purchase price will be paid by ARQANA to the bloodstock agent or trainer who has acted as representative for the purchase. Horses offered for auction are guaranteed by the vendor against the vices listed in section 213 of the French Rural Code, except when they have been announced from the rostrum before the sale. Some lots can be bought back by their vendor. In this case, you have the opportunity to make a private offer. 1- On the day of the sale : if your offer is accepted by the vendor, the purchase is completed by the signature of a Private Purchase Conformation by the vendor and yourself or your representative at the sales. 2 -After the sale : you have 10 days to submit your offer in writing. We will transfer it to the vendor and in case of acceptation, the sale will become final after a Private Purchase Confirmation has been signed by both parties. New ! You can also make an offer via our website, a few minutes after the lot has exited the ring and for 10 days after the sale. To do so, you only need to go to the results page of the appropriate sale and click on the 'Make an offer' button opposite the lot you are interested in. The private sale completed in the abovementioned conditions is considered as a auction sale and the same rules apply, in accordance with the general conditions of sales. A specific procedure must be followed so that the horse(s) you have purchased can leave the sales grounds. The paperwork corresponding to the lot(s) purchased will be delivered once the Purchase Confirmation has been approved by our accounts department. The sanitary documents with the exception of the ownership card and the covering certificate. ARQANA will assist you regarding the transport of your purchase(s) to France or abroad through the transport companies that are present during the sales. Once your purchases and commissions have been settled, we will send you the covering certificate (for in foal mares) and undertake the necessary procedures with the French administration (SIRE) in order to renew the ownership card (for horses that remain in France). If the horse purchased leaves France, we will sort out the exportation procedure, whatever the country of destination. Read the General Conditions of Sale (Section 13). Reimbursement of travel expenses for foreign buyers is available for purchases made at ARQANA for a total of €5,000 or more per sale and will be effective once payment of the horse(s) has been received by ARQANA accounting department. Travel expenses are reimbursed according to a geographical scale. - a copy of your transport tickets or revelant receipts showing the price paid.